"The choice between pipelines and wind turbines is a false one." VANCOUVER — Prime Minister Justin Trudeau used a speech to a clean tech conference Wednesday to make a direct pitch for the expansion of Canada's oil and gas sector — a direction he later appeared to dial back in response to media questions. Trudeau began a day-and-a-half of meetings on climate policy with the provincial and territorial premiers by heralding the promise of jobs and opportunity in a low-carbon economy. He announced two new funds, totalling more than $125 million, to help municipalities and spur clean innovation by promoting climate friendly infrastructure projects and assist with their design. But in recognition of the growing tensions bubbling just under the surface of a country divided by natural resource wealth, the Liberal prime minister attempted to quarantine the divisive politics of oil sands and pipeline expansion. 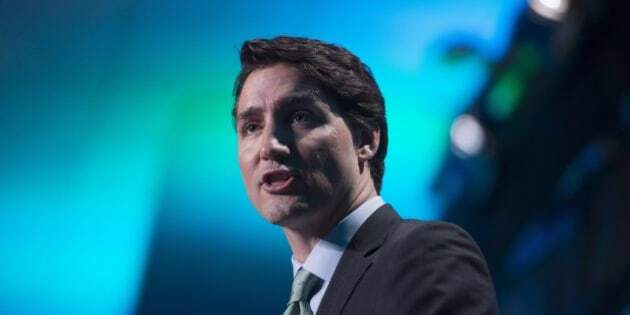 Trudeau received an effusive welcome from a packed plenary of the Globe clean tech conference, where he opened the week-long trade and networking show Wednesday morning with a speech promoting economic opportunities. "But we must continue to generate wealth from our abundant natural resources to fund this transition to this low-carbon economy," he said at the speech's mid-point. "The choice between pipelines and wind turbines is a false one," Trudeau continued. "We need both to reach our goal. And as we continue to ensure there is a market for our natural resources, our deepening commitment to a cleaner future will be a valuable advantage." It was not an applause line in this green coastal city. Trudeau is in Vancouver to make good on an election pledge to meet with the premiers within three months of the Paris climate conference. But his promise to set new emissions targets for the country and create a pan-Canadian climate policy has morphed into finding an agreeable roadmap toward building a policy framework. Even that process-heavy goal appears under stress this week. Saskatchewan Premier Brad Wall continues to torpedo any talk of carbon pricing, although he dismissed corridor talk Wednesday that Saskatchewan might boycott a proposed federal-provincial working group on carbon pricing. "We'll play a constructive role," he told The Canadian Press. But Wall continues to press the case for an expanding Canadian oil and gas industry. "We know that fossil fuels will continue to be burned around the world, certainly as a transition energy, until we get to renewables. That's a fact,'' Wall told reporters, a floor up from where Trudeau was addressing a media throng in the same Vancouver Convention Centre at the same time. He said oil and gas will continue to be "a central part of economies around the world." "Do Canadians want to be a part of meeting those fossil fuel needs? That's the question we have to ask ourselves," said Wall. "And if the answer to that is yes, then we have to build some pipelines." Trudeau's efforts to give Wall and Alberta Premier Rachel Notley some breathing room on pipelines immediately ran into opposition here. "How can we have the Energy East pipeline even on the table?" An onstage question-and-answer session at the friendly Globe conference took a fast detour, when the first question to the prime minister noted that the global climate has already warmed by one degree Celsius. "How can we have the Energy East pipeline even on the table?" demanded Ziya Tong, the host of a popular science program, to scattered hoots and applause from the audience. Trudeau responded that "we all know we have to get beyond fossil fuels, but we are simply not there yet." The issue emerged again during Trudeau's subsequent news conference. "One of the responsibilities of any and every Canadian prime minister is to get our resources to market," he said. "Canada has natural resources and we need to develop those as part our economy and part of our growth." To do so responsibly and quickly during the transition of the next half century is the trick, said Trudeau, and that is the conversation that's taking place at the Globe conference and among the premiers during their meetings here. "There is little substitute for sitting down together," he said. Trudeau concluded the news conference by denying his government is creating conditions for more fossil fuels to be burned. "Actually, what we're trying to do is decrease consumption of oil and gas," he said. "That's where the investments in renewables, the investments in clean tech, are such an important part of our vision for the future."